What is the problem? If you like gardening, chances are that you cannot do without a garden hose. You will be able to water your plants easily but regular garden hoses have some major problems. They often kink, are heavy, tangle easily and are therefore difficult to use. When they kink, the water flow slows and you have to straighten them out before continuing. When they become tangled, you have a hard time untangling its entire length – think about the weight and untangling you need to do with a 100 ft or 150 ft hose. What a difficult and inconvenient chore! Regular kinking might also cause the hose to crack along its length, rendering it useless. Is there a solution? 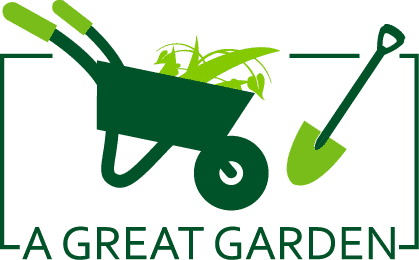 However, the modern generation of expandable garden hoses such as the 2019 model found in GreenFriendlyHome.com is changing this narrative. They are light in weight – a 50 ft hose weighs just 1.71 kg or 3.77 lbs; they never kink, and you will hardly ever face an untangling problem. Instead of worrying about the difficult chore of untangling a long hose, you can look forward to enjoying your time watering your garden or playing with the beautiful nozzle, which has 8 spray patterns. You could be spraying your dog, washing your car, washing your wall, your caravan, your boat or whatever you might be washing. 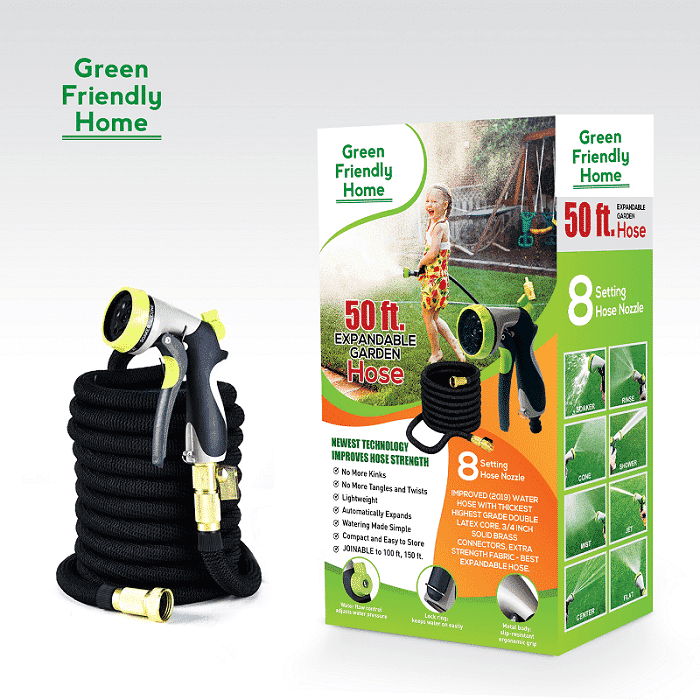 The features of GreenFriendlyHome’s expandable garden hose make it a worthy replacement for your regular hose and you will love it. There is a very helpful user guide which comes with the hose. This product is stretchable and expands up to 3 times its length as water passes through. It comes as a 17 ft. long hose but flexes to reach up to 50 ft. under 4 bars of water pressure, enabling you to reach further using a shorter product. You get immense benefits from this feature because, for one, it becomes very easy to carry around and to store. Once the water pressure reduces and the water is drained from the hose, it shrinks by itself back to 17 ft., occupying a much smaller storage space. The small size of the hose makes it easy to loop into a compact coil and carry it around anywhere. Additionally, it is light in weight, at a mere 1.71 kg, and it never twists or tangles during expansion or shrinking. This is made possible by its high density 3750D knitted polyester cover fabric that expands as the inner hose expands and shrinks back without allowing kinking of any kind. Therefore, as you walk around the garden, you won’t have to worry about tangling, which is usually common with regular hose pipes. If the 50 ft. stretched hose is not enough, you can join more together and get a continuous 100 ft. or 150 ft. hose. Each hose’s end consists of a reticulated brass casing that forms the base of a threaded male connector on one side and a female connector on the other side. These two can be screwed into each other very easily to form a long, continuous pipe. Imagine how easy they are to handle even if you need 150 ft.
Additionally, each end has a double O-ring seal while the female end has a rubber seal that ensures there is no leakage when the male connector on one pipe is connected to the female connector on the other pipe. These seals keep the internal pressure in check so that the pipes can extend up to full length. This product’s metal nozzle is quite versatile and certainly separates it from the rest of its kind. It has a rotating bezel that is used to set 8 different spray patterns. These include soaker, rinse, cone, shower, mist, jet, center and flat. In fact, you will find that these options are probably more than you need but it’s good to have the 8 options so you can use whatever spray setting that you prefer. It’s just fun to use! Apart from these, the nozzle also has a slip-resistant ergonomic grip that enables you to hold on to it easily when it is wet. It also has a knob for controlling the water flow into the nozzle and a lock ring for holding the nozzle handle so that you can free your hands while keeping the water flowing. The nozzle is partly made of metal and is well designed and durable. To top it all off, this hose is likely to be very durable if you take care of it. Apart from its rustproof solid brass fittings, its thick, high-density outer fabric shields the flexible inner latex hose from tangling and other objects that might make it split. However, this class of hoses cannot be dragged over sharp or rough surfaces as this can cause the outer fabric to become frayed over time. Keep it away from the mover! The flexible inner latex hose is actually made of a double layer of latex, and is the thickest available for this class of expandable hoses, enabling it to handle the water pressure easily as it expands while also making it more durable. However, it is important to note that it is not advisable to leave the hose in the sun or in freezing conditions because these might shorten its lifespan. The hose has an operating pressure of up to 12 bars, and a “burst pressure” of 15 bars – the highest among its peers. Expandable hoses are certainly the way to go. They have come of age and have become worthy competitors of the good old rubber and plastic hoses because they provide previously unimagined solutions to garden watering problems. Get yourself this hose from GreenFriendlyHome and start enjoying gardening. As our reader, you can get a discount code to purchase this hose from Amazon, if you send an email to greenfriendlyhome@gmail.com or support@joan-online-store.com to ask for it.